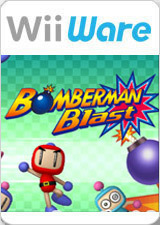 A brand new addition to the Bomberman series is available on WiiWare, Bomberman Blast. Up to eight players can battle online simultaneously via Nintendo Wi-Fi Connection. Simple controls make this a great game for family and friends to enjoy anytime. You can trigger new items by shaking the Wii Remote controller, creating new levels of Bomberman excitement. You can even take the intensity up another notch by adding your own Mii caricatures to the mix. Battle results can be recorded on the Nintendo Wi-Fi Connection Ranking, so you can see how you stack up against others around the globe. This title will prove to be a blast for everyone--from those who've never touched a Bomberman game to the Bomberman masters. Impossible to create a save properly. It's possible to create a save in 5.0-6004, though the UI may be a bit fiddly. This page was last edited on 14 January 2018, at 19:51.